September 11th 2012: Eleven Years Later « How Do You Measure 525600 Minutes? Today is a day of Remembrance. Eleven years ago the world changed… at least my world changed. Every generation has defining moments that go straight to the core of their being. September 11th, 2001 in mine. I thought I’d share an excerpt from my play, September’s Heroes in honor of the occasion. I can’t imagine what your life must be like now… or what it was before. For over 10 years you’ve awakened in the middle of the night, crying, reaching out to the emptiness in the bed beside you. Reaching out for the man that you adored. Gasping for breath between sobs and clutching the pillow where he once so peacefully slept. I can’t imagine what your life must be like now… or what it was before… saying your last goodbyes. You’ve played those moments over and over in you head…things that you thought…things you should have said. Just another morning… a beautiful, extraordinary September day. I can’t imagine what your life must be like now… or what it was before… the moment you heard… time forever frozen on that day. Playing over and over… slow motion in your head. The pain you felt… the pain you feel today. I can’t imagine what your life must be like now… or what it was before…rushing across the room… embracing your child when they were sent home from school. Looking in your child’s eyes… his eyes…his eyes…I can’t imagine what you thought, or what you said. I can’t imagine what your life must be like now… or what it was before…the story you created to get you through the day… day after day. What had happened…what it was like… playing like a movie in your head. You and I had only met once, so very long ago. The fact that you honor me, remember me in your movie… flatters me to no end. It was just another day, like so many before. It was only Tuesday but he was excitedly telling me of the weekend plans you had in store. When the chaos broke out, explosions ripping through the floor, your brave and dashing hero, covered me… shielded me… protected me… as if I were you. He helped me up… and it was if we floated… almost like a dream. Death and destruction surrounded us… and nothing in between. As we stood shaking… trembling, staring out through the smoke and the fire. We knew this was the end. Knowing we would never say goodbye. Staring… staring… staring through the hole… at the clear, blue September sky. He grasped my hand so tightly and walked me towards the light. He turned ever so sweetly… and said, “This is for my wife.” He embraced me and he kissed me standing on the brink of time… a single tear rolled down his cheek, and he turned back towards the sky. I knew then in that moment what he was going to do. I looked at him, so peaceful… all his thoughts on you… he was gone in one quick moment… but he didn’t jump, he flew. The scene ends so abruptly… goes instantly to black… but no credits role… just emptiness and silence… the silent screams deep in your soul. I can’t imagine what your life must be like now… or what it was before… you take a deep breath… you remember… and life goes on once more. — from September’s Heroes by Jeff Linamen, originally produced October 2011, Bartlett High School. 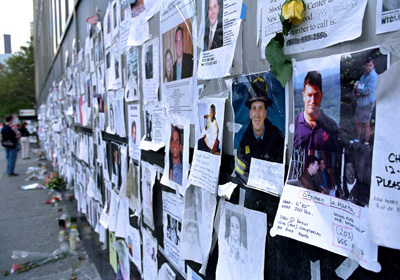 Missing posters displayed throughout New York Ctty in the days and months following the attacks. A view of one of the pools at the 9/11 Memorial. 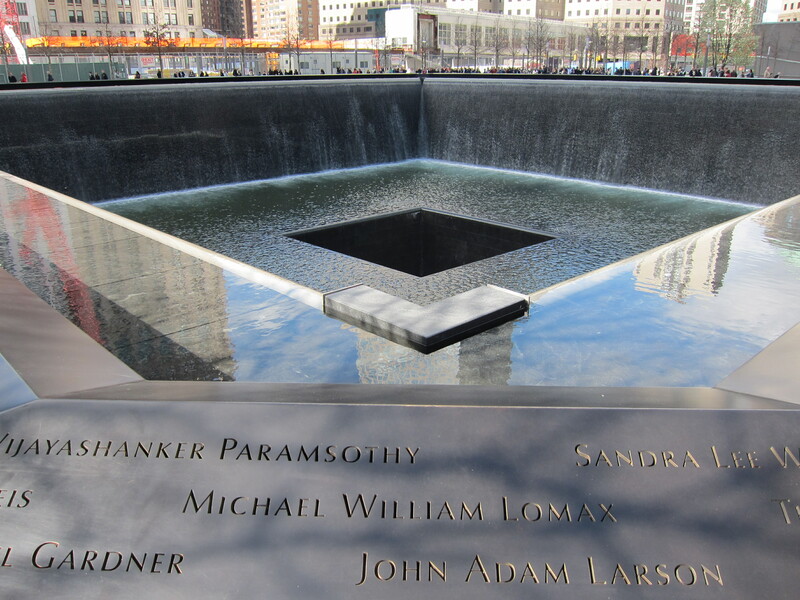 By jlinamen1229 in 9/11/01, education, September's Heroes, Uncategorized on September 11, 2012 .